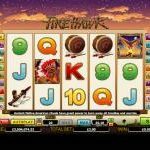 Fire Hawk is a Microgaming slot inspired by the natives of the American continent. On the reels of the game we can see symbols which describe their life and who the original settlers really were. You will get a chance to see some traditional rituals thanks to the great symbol details and the animations used. The slot has a fast game play and nice payouts thanks to the wild symbol and the free spins bonus round. The wild symbol in the game is the Chief and he can land on reels 2 and 4 only. He will substitute for all symbols in the slot except for the scatter symbol. If a wild is involved in a winning combination on reel 2 the payout will be multiplied by x2. If the wild is on reel 4 the win will be multiplied by x4. If a win is formed with wilds on reel 2 and 4 that win will be multiplied by x8. The slot also has a free spins bonus round which is triggered by landing at least 3 scatters on the reels. If you get 5 scatters on the screen you will also be rewarded with a payout of 100 x stake. When the free spins bonus is triggered the player will get 20 free spins with doubled payouts, 15 free spins with tripled payouts or 10 free spins with quadrupled payouts. Fire Hawk is an attractive Microgaming slot which can produce big payouts. The pay table in the slot is rich with up to 6.000 coins payout for 5 of a kind wins. But during the bonus round the payout potential can increase significantly. One 5 of a kind win can award up to a whopping 192.000 coins in a single spin. This is reason enough to give Fire Hawk a try for real play. Being in love in Venice sounds amazing right? The next one captures this spirit: Love Bugs a 5 reel slot by MicroGaming.